AMX-07 (Amlexanox 5% Oral Paste) "The best treatment of mouth ulcer"
Bookcover of AMX-07 (Amlexanox 5% Oral Paste) "The best treatment of mouth ulcer"
Most people suffer with a mouth ulcer every now and then. They're extremely common and usually painful, appearing as little craters in the lining of the mouth. Mouth plays a significant role in moment-to-moment living. And even a minor oral problem can cause significant eating, drinking or communicating health consequences. Imagine, if mouth is constantly taking in potentially mouth harming substances by way of the air you breath, the food that’s munched down on, those teeth picking fingers or bacterial and virus infection causing material allowed to pass through lips. However, not all oral infections, pain or sores originate externally. Some diseases and disorders can be the genesis for trouble. Mouth problems are a universal experience. 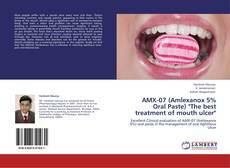 In this regards, finally we find that the AMX-07 (Amlexanox 5%) is effective in reducing aphthous ulcer, pain and lesional size.